Do you feel empty and numb, as if you are in shock? Do you notice physical changes such as trembling, nausea, trouble breathing, muscle weakness, dry mouth, or trouble sleeping and eating? Are you angry - at a situation, a particular person, or just angry in general? Do you feel guilty, expressed as "I could have, I should have, and I wish I would have" statements? Are you absent-minded, have strange dreams or nightmares, withdraw socially, or lack the desire to return to work? Grief is the natural process of adjusting to losing someone or something we love. Experiencing grief and loss is part of every human journey. Feelings that may accompany this life transition include sadness, fear, anger, confusion, and numbness. An individual's needs can vary a great deal when responding to a loss; sometimes requiring space and privacy, other times needing contact and companionship. The response to a loss may happen soon after the event or be delayed for a long time. Current losses may bring up memories from long-ago experiences. Grief is a natural part of life. Grief is a typical reaction to death, divorce, job loss, a move away from friends and family, or loss of good health due to illness. Elizabeth Kubler-Ross identified the five normal processes of grief as: shock (denial), bargaining (“if only…”), anger, sadness, and acceptance. 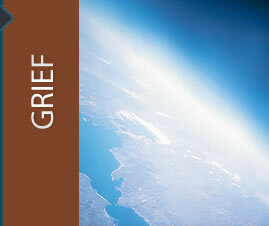 Grief is not an orderly march through these five processes but typically bounces back and forth among these processes. The truly-healing process of grief is sadness, that is, honestly experiencing the loss and feeling and expressing the pain of that loss. This leads to “acceptance” and the experience of well-being despite the loss. Most people who experience a loss can go through a grief process without professional help. But if you find that you are not progressing through these natural stages of grief, you may need therapy to help you get unstuck and moving toward true healing. Signs of being stuck in grief include depression, emotional numbing, and obsession with what was lost.